Same here with our own LabTech server with LT10.5. However a slight change is that our triplicated monitors are all based on the management packs. (as it seems). Reporten the bug only yesterday so don't have a status update. Did you hear any possible solution? Cleaning all monitors @ 850 servers is not something I wish to do manual. I've seen this too on 10.5 but its not across the board. I'm seeing it mostly on some of the exchange server role monitors. 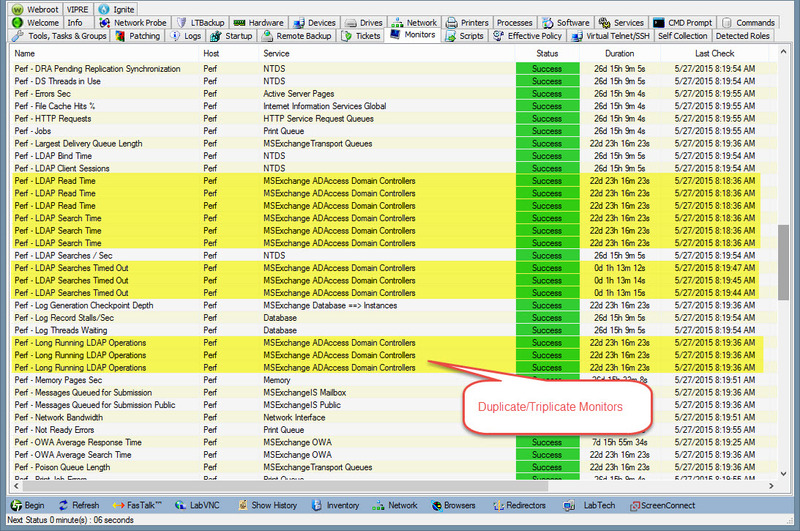 My Duplicates where created by conflicts between group monitors and Management Packs. LT advised to update 10.5 to patch3 but the problem was caused by updating labtech ignite packs via the solution center. From all duplicate monitors, just one was controlled by the management pack and the other(s) controlled by groups. So, I know Patch3 should fix something and solution center updates should be installed very carefull to avoid this from happening again. We had the same problem with 10.5 and we were told by the LT technician that we talked to that we should call in and talk to 2 separate technicians before updating ignite. If we get the same answer from both technicians, then we are safe to update. That doesn't give me much confidence in updating this product through their own update process. Just thought i would share what the technician said to us.